Clark County Sheriff Doug Gillespie recently made national news as a “peacemaker,” who brokered a deal between the U.S. Bureau of Land Management (BLM) and a recalcitrant Nevada rancher, Cliven Bundy. Backed by hundreds—possibly thousands—of supporters committed to preventing arrogant, heavily armed federal agents from driving his family off leased grassland, Bundy refused to knuckle under to government use of force. While Gillespie was mugging for the cameras, flanking a tight-jawed Cliven Bundy, the sheriff’s gunned-up, battle-ready SWAT team was on the other side of the gate. Those officers were milling around with armed BLM agents, Nevada highway patrol officers, and hired-gun mercenaries, obviously ready to support the feds, if the agents decided to shoot civilians. 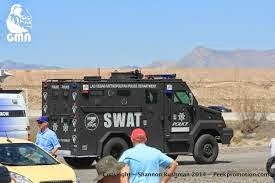 In televised accounts on Fox News, the Las Vegas Metropolitan Police Department’s black, armored SWAT vehicle was clearly visible among dozens of federal SUVs and cop cars. In his remarks to the media and Bundy supporters, Gillespie stated that he was committed to enforcing “federal law,” but brokered a BLM stand down and retreat to avoid bloodshed. I commend him for that. However, the sheriff also was violating his sworn responsibilities to the people of Clark County, NV—those who had elected him. As usual, Gillespie claimed to be on the right side of “law,” but was on the wrong side of right. Gillespie had absolutely no compulsion to reflexively assume the federal government’s claims were legitimate. An honorable sheriff would have given the benefit of doubt to Bundy—especially when the U.S. Environmental Protection Agency was behind the assault. Based on long years of precedent and federal court rulings, Dougie definitely was not justified in sending his trigger-happy SWAT team to back federal agents threatening and abusing Clark County citizens. In fact, as sheriff, he was compelled to do the opposite. If THE RIGHT SHERIFF had been wearing the Metro badge now stuck to Gillespie’s chest, he would have been intimately familiar with that 1997 court ruling, which empowered county sheriffs across the nation. He also would have read and understood the principles outlined in Sheriff Richard Mack’s superb book, The County Sheriff: America’s Last Hope. Further, America’s county sheriffs “have the authority, the power and the duty to be the ultimate check and balance…to defend [American citizens] against all local and federal criminals,” Mack said. Obviously, Clark County’s sheriff failed to exercise that authority and power, during the Bundy Ranch standoff with the federal BLM. Doug Gillespie refused to honor his duty and protect his constituents. Instead, he ordered his Metro SWAT unit to gun up, don battle gear and hunker down with the feds’ agents. Once again, Sheriff Doug Gillespie has demonstrated three glaring truths: He does not serve the citizens of Clark County. He’s an integral element of an incredibly venal and malfeasant Cartel of Corruption that controls the county and has tentacles into the federal leviathan that chips away at Americans’ freedom every day. Finally, Gillespie routinely genuflects and does the bidding of the county’s chief political marionette, Senator Harry Reid. I have reason to believe that Harry Reid and his son, Rory, are intimately involved in the BLM’s heavy-handed campaign to drive ranchers off private and leased lands throughout Nevada, clearing the way for other, obscenely profitable uses. Fifty-two ranchers reportedly have succumbed to federal pressure already. Bundy didn’t. • Building massive solar farms. • Mining and extracting rare earth metals, which are critical to national defense. • Securing water rights, always an objective of insatiable Las Vegas and its corporate power brokers. I suspect Harry Reid and his billionaire backers are going after rare earth metals, such as yttrium, lanthanum and neodymium. Seventeen of these elements are used in lasers, special magnets, nuclear devices and myriad military weapon system sensors. China cornered the market on rare earth elements (REEs), but, in recent years, has been limiting exports. Consequently, prices for REEs have risen sharply, and large corporations are actively pursuing rare earth deposits throughout the West. Whatever the grand plan, hatched in secrecy by corruptocrats and wealthy moguls, Gutless Gillespie and his taxpayer-funded hired guns aligned themselves with the federal government. Every single Metro officer should be embarrassed and ashamed. Hopefully, Clark County will elect THE RIGHT SHERIFF this year, an honorable lawman, who can be depended upon to stand on the right side of right. If county electors cast smart votes, future egregious, overreaching power plays by federal thugs will be met by a courageous sheriff and professional officers, who refuse to shoot and kill their Nevada neighbors to enforce dubious federal regulations, regardless of legal double-talk spewed by greedy political hacks. WHO GETS THE POLICE UNION’S LOVE & KISSES?